I love the look of large planters. They bring nature onto patios and decks. Many stores carry very large designs that are just gorgeous. But large planters can be cumbersome and heavy to move around because of their size. They also use a lot of soil which can be quite expensive. The answer to this problem is to use packing peanuts or other lightweight material (corks would do too) as filler for the bottom of the pot. 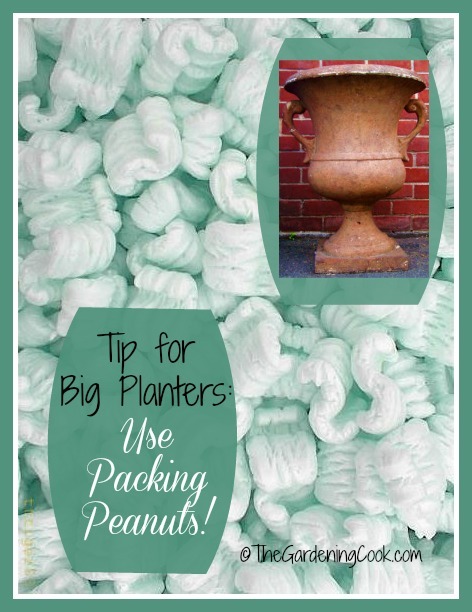 Just fill up 1/3 or 1/2 of your pot with foam packing peanuts. They will not only make the pot lighter but they also have spaces around them, so this helps with the drainage of the water in the soil above. 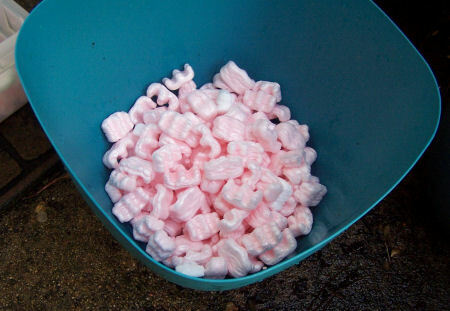 Be sure to test your packing peanuts to see if they dissolve in water. Some do. You don’t want to look into your pot tomorrow and see the soil half way down the pot! An added benefit is the soil savings. You can plant twice as many pots with the same amount of soil. One handy tip which I did not think to do this year, much to my dismay. If you just dump the soil on top of the peanuts, you will have a chore when it is time to re -pot, since the roots will grown around the peanuts. Solve this problem by putting the peanuts into an onion bag to contain them! I cut a piece of landscape fabric to put on top of the peanuts. When I didn’t have packing peanuts, I have also used Styrofoam pieces that come around electronics (broken or cut into chunks) or empty plastic soda bottles. Can I use potato sack material instead of landscaping fabric over the peanuts? I have decided to move all my GAZILLION tropical milkweed plants to large metal water troughs in the backyard. I was going to use the packing peanut filler idea, but does using a metal container emit heat problems?? Hi Ann. Yes, using metal containers can give you heat issues for plants. There is some risk that the roots of the plant will heat up too much in the sun. Some precautions are to place your container in a spot that receives some shade. Lining the pots with with newspaper can help insulate plants from heat too.